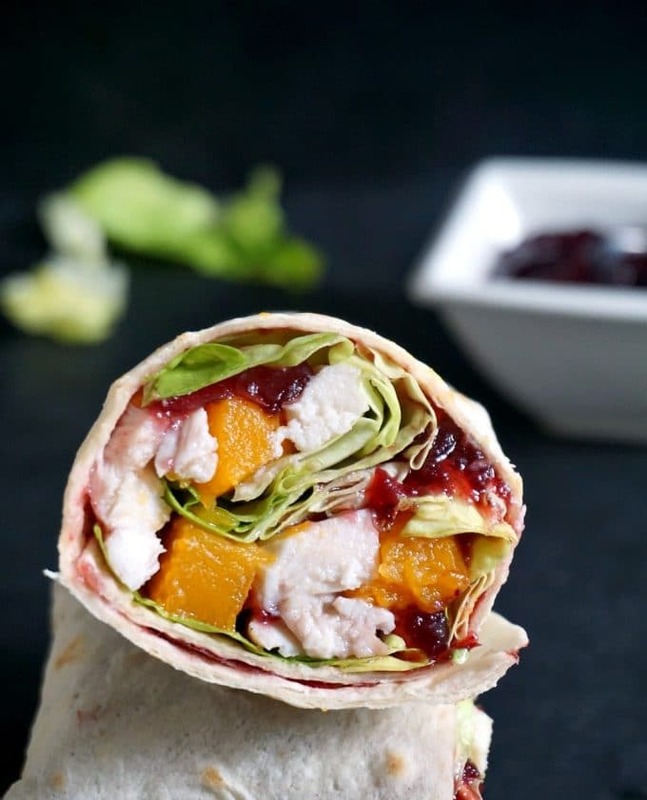 Leftover Turkey Wraps with cranberry sauce and butternut squash, a fantastic way of using up food that might otherwise go to waste after a big feast like Thanksgiving, Christmas or Sunday Roast. These leftover turkey wraps only take about 5 minutes to put together, and are so delicious and healthy. 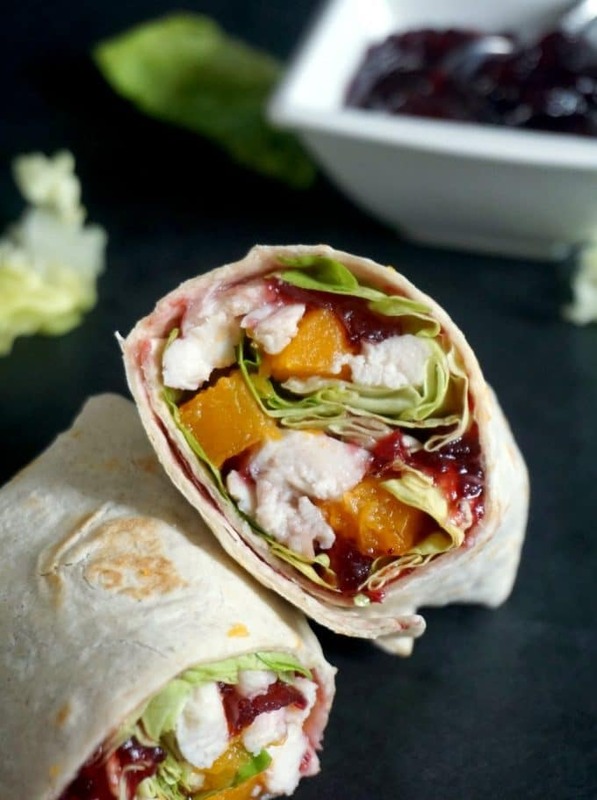 Great as a lunch or light dinner, packed with protein and fiber, the wraps have a sweet touch from the cranberry sauce and butternut squash. I don’t like food waste, although l admit sometimes l either buy stuff l don’t have time to cook, or cook way too much. I really need to work more on portion control, and also a bit of planning ahead. Most of the time l do shopping without a clear image of what l’m going to cook with those ingredients, and inevitably some are left uncooked. That’s bad! Fall is here already, and with it the most-awaited holiday of the season: Thanksgiving. And if you have a larger family, or a large group of guests, the Thanksgiving Turkey will have a rather generous size, so there are always leftovers, no matter what. So, if you wonder what to do with leftover turkey, the answer is right here. 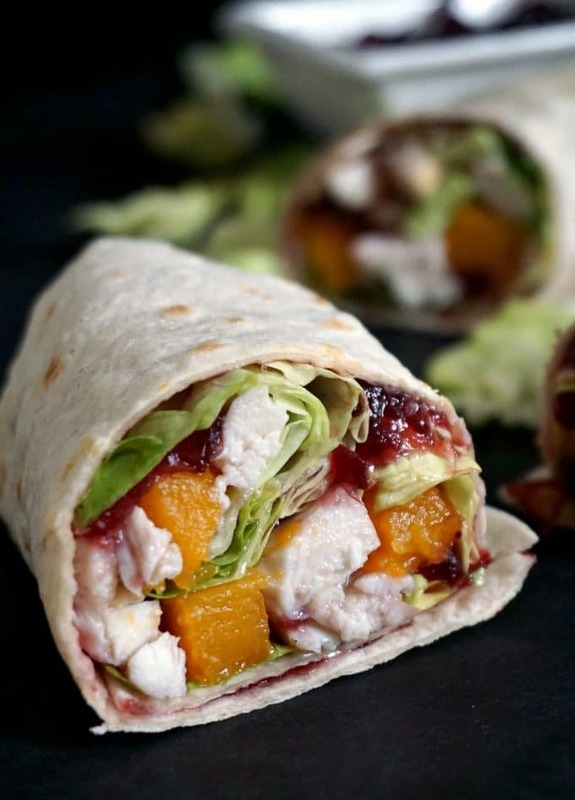 With these wraps, you can use up whatever is left, turkey, roasted butternut squash or pumpkin, cranberry sauce, salad, or indeed any other veggies and sauces. They are great on the go or at home. 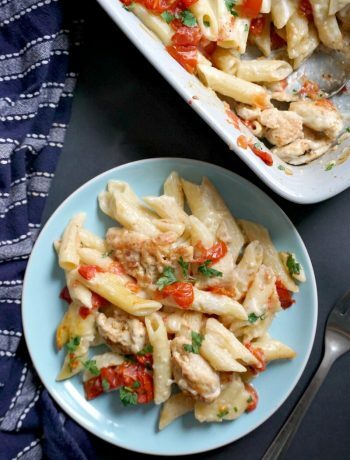 Leftover turkey doesn’t usually keep too long in the fridge, I personally would not leave it in there for more than 2 days at the most, as it will start to dry out and not taste as nice as when it was freshly-cooked. Best to store it in airtight containers anyway, and use it up asap. Another great way of using up leftover turkey is a nice pie. 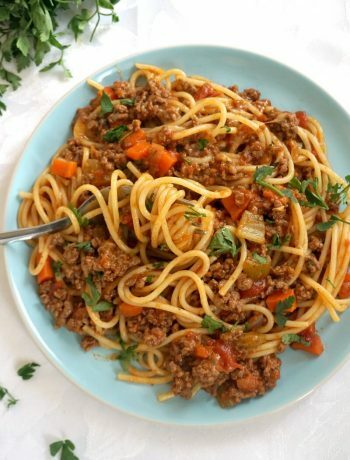 They taste well, usually have a nice gravy that brings back some moisture to the meat and has veggies that can be used in case you have lots leftover. 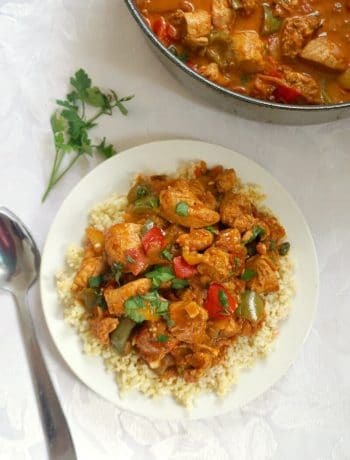 Curries are also great, I have a delicious butter chicken curry recipe, so you can totally swap chicken for leftover turkey. For the wraps, you can use either corn or flour tortillas, white or wholemeal, whatever you have. I would recommend using a homemade cranberry sauce, which is free of additives and so much healthier and tastier than the jar ones from stores. These are usually loaded with sugar, and that changes the very sharp taste of the cranberries. If you would like another great wrap recipe, how about my super popular Grilled Chicken and Avocado Wraps? If you’ve liked my HEALTHY LEFTOVER TURKEY WRAPS WITH CRANBERRY SAUCE or any other recipe on the blog then don’t forget to rate the recipe and let me know how you got on in the comments below, I love hearing from you! You can also FOLLOW ME on FACEBOOK, and PINTEREST to see more delicious food and what I’m getting up to. 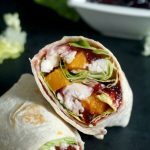 Healthy leftover turkey wraps with cranberry sauce, a great way of using up food that might otherwise go to waste after big feasts like Thanksgiving, Christmas or a big Sunday Lunch. Heat up 2 tortilla wraps, either by placing them in the microwave for 20-30 seconds, or on a large frying pan over a meadium heat for about a minute on each side. Spread one tablespoon of sour cream on each tortilla, leaving about one inch from the edge. Sprinkle one tablespoon of the cheese on each tortilla, then divide the lettuce wraps, turkey and butternut squash between the two wraps. Top with cranberry sauce, the wrap tightly. You can also cut each wrap in half, if easier to serve. Swap turkey or cooked chicken, and butternut squash for pumpkin or caramelized carrots. I love the sound of this and oh that cranberry sauce – must be really delicious 😋 Thanks for sharing, Daniela.